Misrad HaBriut is warning the public to avoid getting “black henna” tattoos because they can cause severe allergic reactions. Black henna is different than regular henna because it has an additional chemical added to it to speed up the tattooing process. It is this chemical, called PPD, which causes the allergic reactions. Black henna tattoos are frequently seen at festivals and other stands. Teva Pharmaceuticals has been unable to produce Ikaclomin for some time now but has been providing Serophene as an alternative medication. Unfortunately, Teva is now unable to provide Serophene. The kupot cholim have been notified of this issue and will be permitted to import similar drugs for off-label use until such time as Teva is able to provide Ikaclomin. Misrad HaBriut’s Pharmaceutical Division is following the issue and will notify the public of any changes. 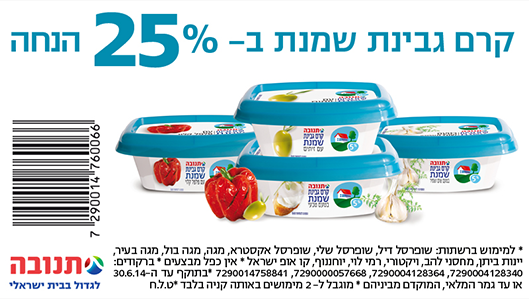 Misrad HaBriut publicized new recommendations this week in response to the increased reuse of egg containers for crafts. Because of the known presence of Salmonella bacteria in eggs (particularly on the egg shell) and because it is impossible to sufficiently clean egg containers to destroy Salmonella, Misrad HaBriut recommends not to reuse egg containers. 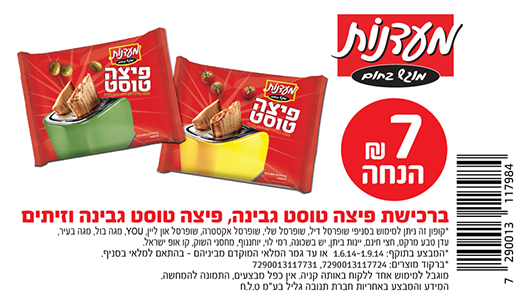 Misrad HaChinuch has adopted this recommendation and forbids the reuse of egg containers in educational institutions. Misrad HaBriut expands the recommendation of Misrad HaChinuch to include rehabilitation centers, old age homes, hospitals, and psychiatric centers. 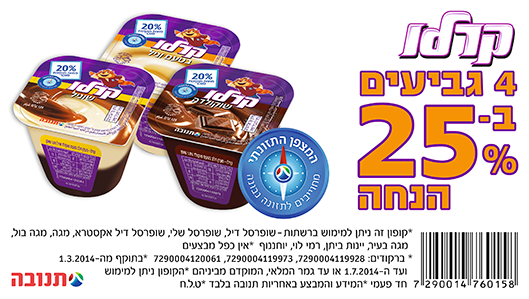 You can read the directive on the Misrad HaBriut web site (Hebrew). 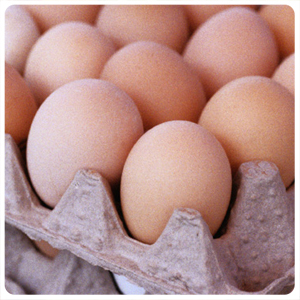 For more information about reducing your risk of Salmonella from eggs, go to the CDC web site. 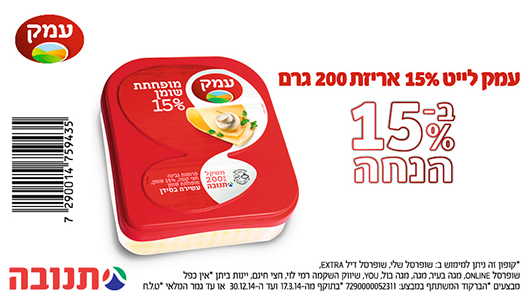 The Dan Hotel in Tel Aviv is offering two new specials in their restaurants: Friday all you can eat buffet brunch for only 97 shekels and a business lunch for 130 shekels per person including a glass of wine and free parking. The hotel is located on 99 HaYarkon Street overlooking the sea. The hotel states that the restaurants are kosher but confirm before going. 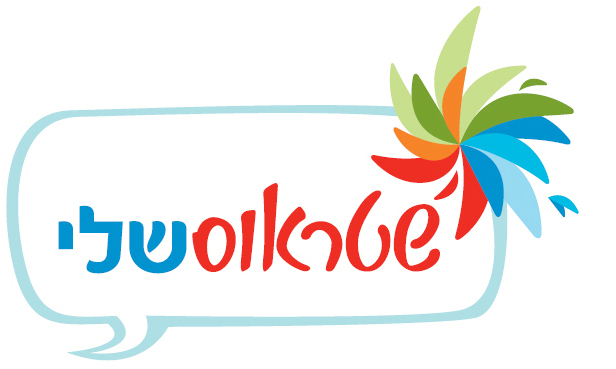 For more information, call 03-5202424 or go to their web site. Travelling to exotic locations this summer? Stocking up your emergency pantry? 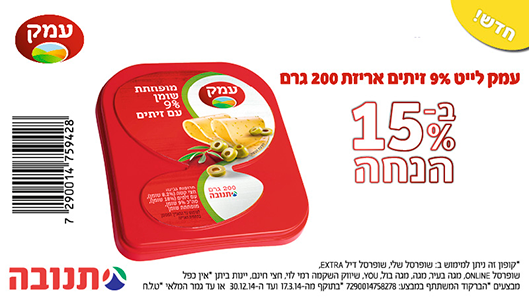 Consider Chef HaDerech meals- 8 different fish, meat and vegetarian meals that do not need to be refrigerated and come with their own heating packet. They have a shelf life of 3 years thanks to a special technology that preserves the quality of the meal. 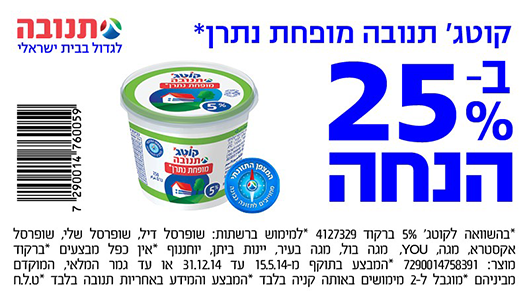 The meals are kosher under the hashgacha of Badatz Beit Yosef and cost between 29 and 32 shekels. You can purchase them online or in Richochet, Sonol gas station stores, and many other stores listed here. It is official: milk and dairy products will be more 8% more expensive starting in July. This includes price-controlled products. The reason? The price of food for cattle, sheep and goats has increased. 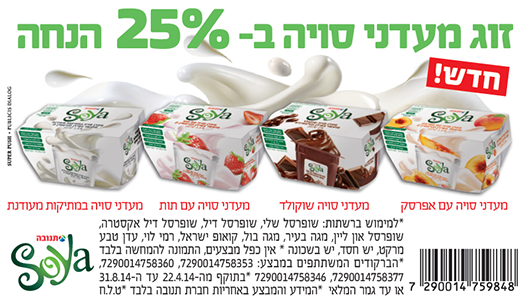 Shaveh is offering a half price deal for Cafe Greg in the Gan HaIr mall in Tel Aviv- 71 Ibn Givriol Street. 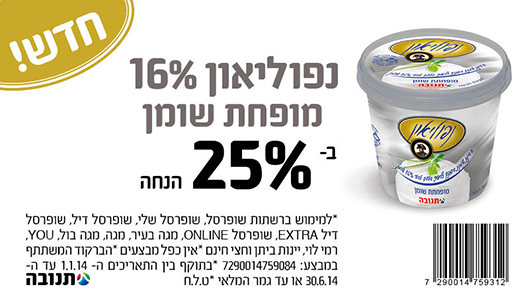 Pay 5 shekels to Shaveh and 44 shekels to Cafe Greg for a voucher worth 89 shekels. The voucher includes a glass of beer and either fish and chips or noodles. To purchase, go to the Shaveh web site. 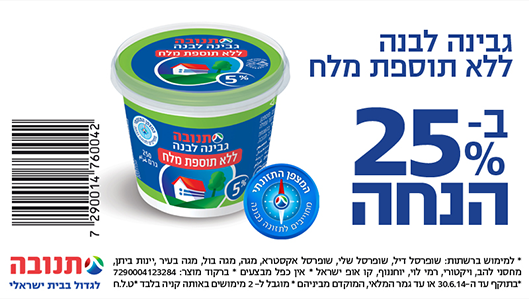 Pri HaGalil has announced that as the result of routine testing, there is a risk of the presence of Listeria monocytogenes in “Chumus Misadot” products under the brand name “Yad HaMelech”. If you are in possession of this product with a sell by date of 1 July 2014 (400 grams) or 15 July 2014 (400 and 800 gram), you are asked to refrain from eating the product and call Pri HaGalil at 072-2640150 to return the product and get another one. Listeria monocytogenes is a bacteria that can cause disease in high-risk individuals such as those with weakened immune systems or cause abortions in pregnant women. 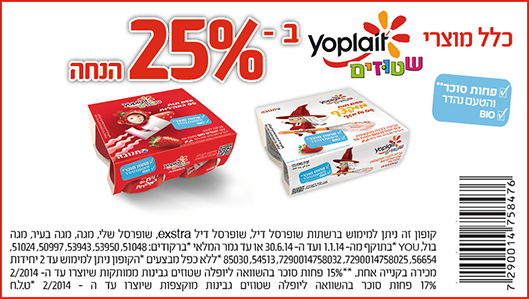 *Every Friday get a movie and meal for only 49 shekels! Participating movies only. The Ministry of Health is warning the public that the citronella spray “Mosquitush” produced by La Creme under the name “Mommy Care” is not approved by the Ministry of Health and is not being manufactured in accordance with the law. When buying products such as these, the Ministry of Health recommends that you check the list of approved cosmetics and toiletries on their web site before purchasing. Strauss has removed it’s coupon section from it’s Facebook page and introduced My Strauss- an online center for lots of coupons, recipes, comments, and more. You can even get free samples of new foods and give reviews. There is no cost to join. Click on the picture to sign up.